New Video!!! You won’t be shocked that I have one more keto recipe for you! But even if you are not remotely interested in Keto, I think that you are going to absolutely love this recipe. However, if you are trying to eat in a specific way, this recipe checks A LOT of boxes! Keto, Paleo, Whole30, Low-Carb, Gluten Free, Dairy Free and more. Also, in true Seattleite desperation, we hit the rooftop pool at the hotel we stayed at, despite the fact that it was only 67 degrees. To us it was hot, and we were full bore swimsuits on, swimming and hanging next to the pool despite the moderate temperature and partly cloudy sky. ROOKIE MOVE: no sun screen. It seemed like the most harmless couple of hours. Only it wasn’t!!! We are all burned to a crisp. Ironically, considering our coloring Pete is the worst, probably followed by Coco. But those two are already turning a nice DARK brown color. I on the other hand have lobster thighs and shoulders which are requiring a rather steady diet of Tylenol they are so uncomfortable! I don’t anticipate a tan developing ever. Just wrinkles and sun spots. Sigh…. Ok, Let’s get to the food. This Recipe was actually created last summer when I was dabbling in Keto and the new What’s Gaby Cooking cookbook had come out- there is a recipe for tomato saffron confit in there that I made a ton and eventually based this fattier twist on (I was on Keto!!) for the spicy tomato garlic confit in this recipe. YUMMMM. Thank you Gaby!! I pile it on what was otherwise a really simple roasted fish recipe and it makes it POP! I know you will love it just as much! In a small pot combine the tomatoes, fresh chile, thyme, chopped garlic and olive oil (along with a generous sprinkle of kosher salt. )Bring to a simmer over medium heat and then reduce the heat and let simmer on the lowest heat for at least 20 minutes and up to an hour. This is also great to refrigerate up to a few days and then reheat as needed. 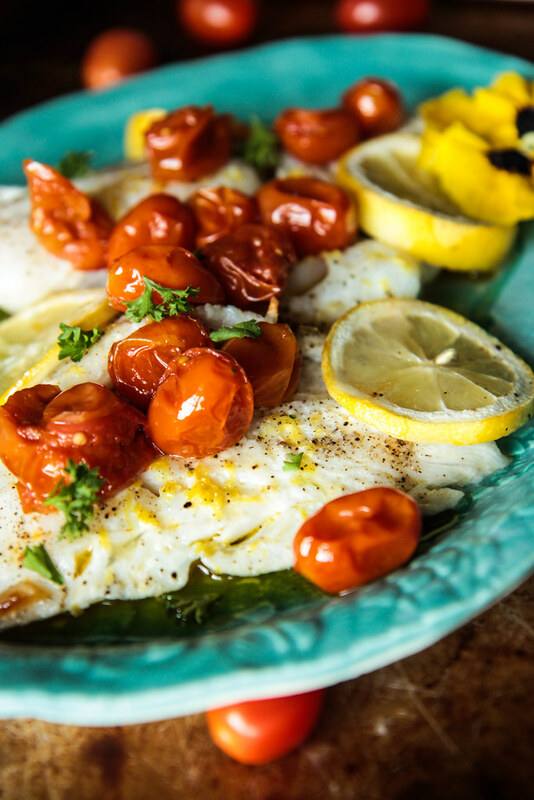 Line a baking sheet with foil and place the fish filets on the foil. Season with kosher salt and black pepper and then zest a lemon onto the fish. Slice the center of the lemon into about 4 slices and nestle them in with the fish. 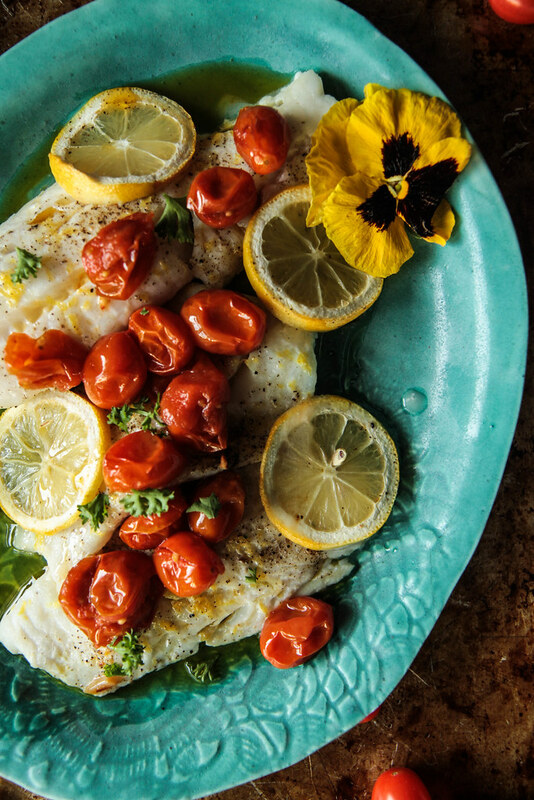 Use the remaining ends and squeeze the fresh lemon juice onto the fish filets. Place the fish in the preheated oven and bake for about 8 minutes. 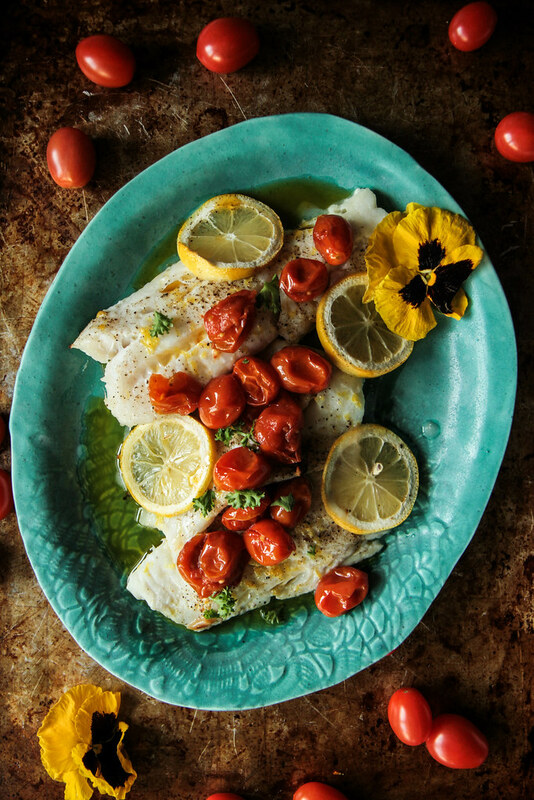 Remove the fish from the oven and serve with the baked lemon slice and top with the caramelized spicy tomato garlic confit sauce. A fond lover of fish.